Get to know the community of Barcelona in 54 seconds with our community tour uploaded to YouTube in HD. Square Footage: 638 sq. ft. - 1,200 sq. ft.
Barcelona is in close proximity to the Gainey Ranch Golf Club, Starfire Golf Club, Camelback Golf Club and McCormick Ranch Golf Club. Looking for a condo with a Paradise Valley mailing address at a bargain-basement price? Barcelona could be just what you're looking for. Generally speaking the 85253 zip code is reserved for those buying luxury real estate and homes from $500,000 up to a staggering $30,000,000. There's no theater rooms, fitness rooms, billiards rooms, business center or concierge service at Barcelona. However, the community is gated, has a pools, the grounds are clean, and the location is out of this world fantastic. This is one of those communities where a car is optional if you enjoy walking. Right out the front gate heading east are stores like Ace Hardware, Cirlcle K, New York Bagels and Bialy's, NYPD Pizza and Oregano's. Once you cross Shea, there's a Harkins movie theater, Safeway grocery store, Starbucks and many more stores and restaurants. There's a bus stop just to the east of Scottsdale Rd, and highly rated Chaparral High School is approximately 1/4 mile away. These were originally apartments that were converted and sold as condos in 2005. Many if not all units received updates at that time including, but not limited to cabinets, flooring, counter tops, appliances and fixtures. If you need a garage, Barcelona is not going to work as units here come with covered carports. The complex is on the smaller side with a total of 96 units. 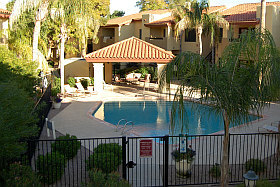 Normally you can expect to find five or six Barcelona condos for sale listed on the Arizona MLS. Get to know Barcelona condominiums in 55 seconds with our community tour uploaded to YouTube in HD. If preferred check out our photo album.